Here is a brightly coloured cauliflower and broccoli salad. 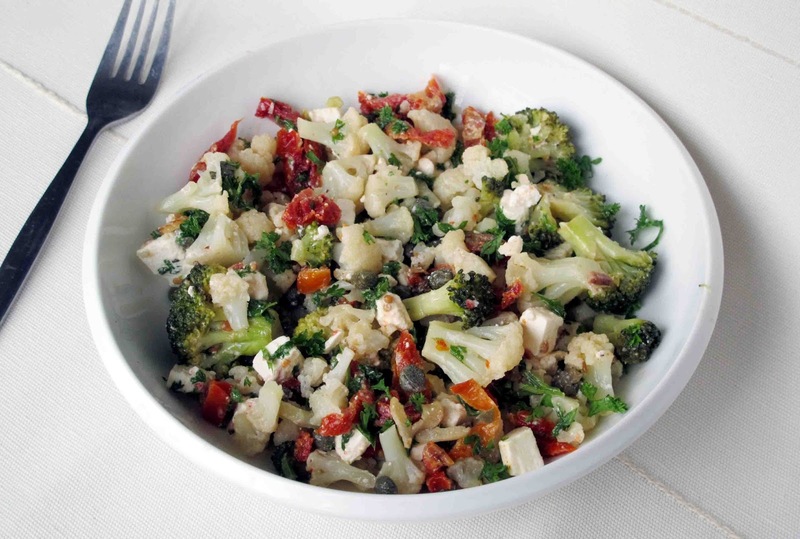 The red, white and green vegetables look especially lovely served in a white bowl. Any leftovers will keep well in the fridge and can be taken to work for lunch the following day. Boil the cauliflower and broccoli florets in salted water for 2 minutes. While it is cooling slightly fry the finely sliced garlic in a tablespoon of ooil until it is golden brown. Be careful not to burn. Add the garlic and the oil it was fried in to the salad bowl . Then stir in the sundried tomatoes and capers. Squeeze lemon juice over, and stir again.